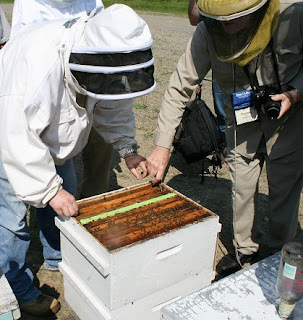 Basic Beekeeping: LESSON 61: WHICH IS BEST: A NUC OR PACKAGE? Hello from Long Lane Honey Bee Farms, and welcome to today's lesson in Beekeeping, as we look at the best way to start up a hive, whether it be package bees, a nuc or buying an existing hive. Don't know what a nuc is? Then read on. Today's Blog/Lesson will be a lot of fun. I'll show you some questions from the master beekeeper test and you can see how well you would have done. Plus, information on our upcoming class and photos from the EAS meeting in Ellicottville, NY. Before we get into today's lesson, let me say that so many people have signed up to receive these lessons directly as Emails. It's free, and you can unsubscribe any time. Use the link below to add your email so that every time we create a new lesson, you'll be sure to receive it right into your INBOX! And don't forget to sign up for our classes we are offering in a few weeks. We still have a few openings. You can register online at: www.honeybeesonline.com/classes.html On this link, we have maps and directions. I made it home from a week in Ellicottville, New York attending the Eastern Apicultural Society (EAS). Wow! What a jammed packed week of super lectures, demonstrations and new and helpful information on beekeeping. Being able to attend workshops of the most well known entomologists in the country was very informative. Almost all of the speakers were more than approachable throughout the week, and needless to say, I picked a few brains. 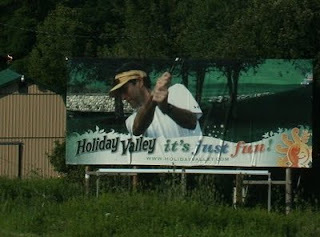 I was really impressed with the Holiday Valley Resort. It's really designed for golfers and skiers, but it quickly became home for over 400 beekeepers. 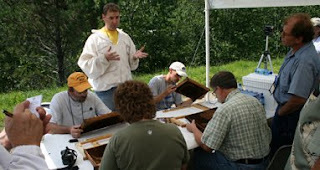 Here's Dave Tarpy giving an outdoor class on queen rearing and grafting. Dave is extremely intelligent and has an effective way to translate his knowledge down to the average beekeeper. As I told you in my last communique, I've started my journey on becoming a master beekeeper. I studied long and hard and did the best I could. 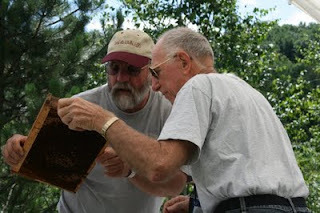 This master beekeepers certification used to be associated through Dr. Morse with Cornell University, but was taken over in 1981 by the Eastern Apiculture Society under the direction of Dr. Clarence Collison. It is a very vigorous and thorough program. I tested in all four areas hoping to pass at least one my first year, and did better. I passed two! And only missed the third one by 6 points. This will give me 51 weeks to study up and try to pass the other two sections next year. (These are various pictures taken from the convention). a) within the first 24 hours after a virgin queen emerges from her mating flight. b) when the queen begins to lay eggs. c) after the queen begins to lay eggs. d) just before the queen is ready to take a mating flight. "The ovaries of worker honey bees have _______ovarioles. The answer is: BHere's a picture of Gary Reuter who works with Marla Spivak on the Minnesota Hygienic Queen. Gary is a swell guy and always a lot of fun. Queens infected with nosema disease cease egg-laying and die within a few weeks of infection? The principle component of the alarm pheromone associated with the mandibles is isopentyl acetate. The commercial production of apples requires cross-varietal pollination. The answer is: TRUESacbrood infected larvae are unable to molt from the larval to the pupal stage. One essay question asked to give a detailed explanation of how to use the "Demaree Technique." The lab testing contained tables set up with various medicines, real infected frames of various diseases and tables with beekeeping equipment. The microscopes were set up with various pests in which we had to identify pests such as a male mite versus a female mite. So as you can see, it is a pretty thorough test. I have the highest respect for EAS. 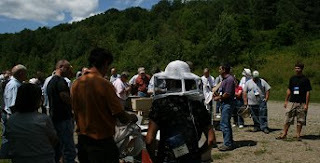 I believe it is one of the best beekeeping organizations that I know of, and I would highly recommend that all beekeepers attend the EAS. LESSON 60: WHICH IS BEST? A NUC OR A PACKAGE OF BEES? People are already calling us trying to reserve package bees. This year, everyone sold out faster than normal and left many beekeepers disappointed that they did not secure their orders earlier in the year. It happens every year. So let me give a brief run down on the proper way to make sure you purchase bees in time for a great spring. There are three options: Packages, nucs or to purchase an existing live hive. Now, let me give you the pros and cons. A) A Live Hive. This is probably the most difficult to purchase. Very few beekeepers want to sell a good, live hive. For example, one hive can earn me around $500 per year in producing nucs, queens and honey. So why would I want to sell it for half that price? So when a beekeeper wants to sell, the big question to ask is why? If the answer is understandable, like maybe the beekeeper is moving or has become allergic to bees or passed away, then that may be a good deal. However, when you purchase a live hive, you are also purchasing all the existing problems such as small hive beetles, tracheal mite, varroa mites, wax moths or diseases such as nosema, American Foul Brood or European Foul Brood or deformed wing virus, just to name a few. Never purchase a live hive until it has been thoroughly inspected by a state apiary inspector and given a clean bill of health. This might be a good approach, but you have to find a beekeeper willing to sell a hive, and then make sure it is a clean hive. Remember, American Foul Brood can live on equipment for up to 80 years! Never buy used equipment if you are a new beekeeper! B) Packages. Packages have been the way beekeepers in the North have received bees from the South for over 100 years. Southern beekeepers shake bees out of their hives and into screened cages. Sometimes it may take shaking bees out of three different hives to equal three pounds. Then, a new queen, in a separate cage, is placed in among the bees along with a can of either hard candy or sugar syrup. But there are some concerns. Let me list a few:--Will the queen be healthy and properly mated. the bees and the queen. both the reproductive ability of drones and queens. So, while this is the "industry standard" and has been for a century, it is not risk free or fail safe. C) NUC. What is a NUC? A nuc is a short expression referring to the nucleus of a live hive. The nucleus, or nuc, usually contains four or five frames from a complete hive. Those frame include brood in various stages and frames mixed with honey, pollen and brood. The queen has already been accepted and is the mother of all the bees including the brood in the frames. Below are two lists, the first will be the advantages of a nuc, and the last will be the disadvantages. Advantages of a nuc:--The frames are from a proven, successful existing hive. --The queen is released and has been laying among the frames for some time. wait for the bees to draw comb. --Since nucs are picked up, there are no shipping stresses. --It is easy to transfer the frames into your own equipment. --Are not usually available until June. --You receive comb from another beekeeper that could contain pests or diseases. In conclusion, any of the three above options can work and work quite well. If you work through the pros and cons, then you can see which options is best for you. I'm not afraid of starting with a nuc or a package. But, I would be very nervous about buying someone else's live hive. I probably like the idea of packages better, because I can get a two month head start. Some say that time wise, a June nuc will be as far along as an April package in June. But that is not entirely true. An April package will be weeks ahead of a nuc by the same time in June. In my opinion, there are as many chances to be taken by buying nucs as there are packages. Nuc providers are not above small hive beetles, mites or diseases. When we sold our nucs this year, they were inspected frame by frame by our state inspector. They passed with no problems. But state inspectors do not inspect for Nosema or Tracheal mites. So I'd say the playing field is pretty even as to which is better, a nuc or a package. That's it for today's lesson and I hope you've enjoyed our time together. Our next lesson will be about how you should manage your hives now that summer is heading into fall. We'll talk about combining weak hives with strong ones, and how to treat for mites and how to feed hives that are low in stored honey for the winter. Today I received many calls from folks thanking me for these informative lessons, and we do enjoy sharing our knowledge with you. We also want to thank you for your business. We realize you could purchase your beekeeping supplies from the "big-boys" so we appreciate you supporting a hard working family business.